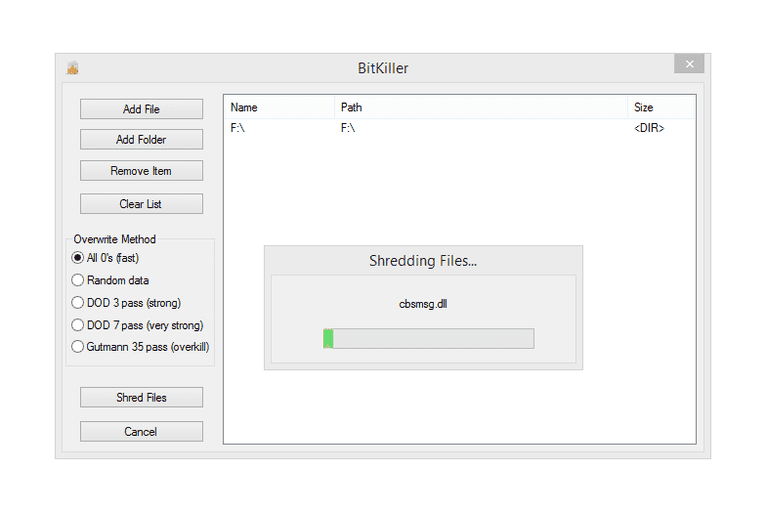 BitKiller is one of the easier to use file shredder programs available. Not only does it support securely deleting specific files and folders, but you can even use it as a data destruction program by erasing a whole hard drive at once. It also doesn't hurt that it's completely portable. Popular data wipe methods are available and BitKiller has all of its settings visible, which means it's not hard to use in the slightest. This review is of BitKiller version 2.0. Please let me know if there's a newer version I need to review. With BitKiller open, you can drag and drop anything onto the screen to be deleted, like multiple files and folders or entire internal or external hard drives, including flash drives. Because BitKiller runs from inside Windows like a regular program, it's unable to lock the primary hard drive from being used, and therefore can't erase it. See DBAN, CBL Data Shredder, or HDShredder for software that can erase a hard drive even if it's running an operating system. Just click Shred Files and confirm it with Yes to begin the process. BitKiller is one of my favorite data destruction programs because anyone can use it. It's not too hard for novice computes users, and it's not so simple that a pro feels like they're missing something with this tool. The interface is especially clean and void of clutter, which helps eliminate any confusion on how to use it. However, because of the lack of some advanced options, features like suppressing the confirmation prompt and exiting after a data wipe aren't supported, which is too bad. In short, if you don't want file recovery programs to be able to recover your data, BitKiller is a great option to aid in privacy.